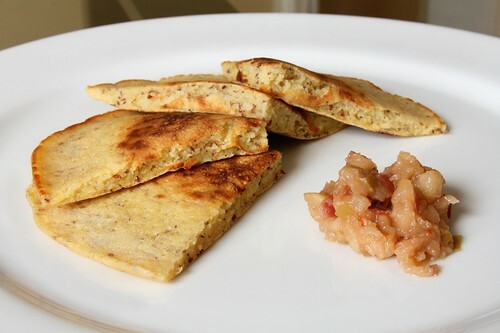 hearty polenta pancakes with apple-puya sauce, originally uploaded by aarn! +8th October, 2009+. mixed together 1/2c. sifted all-purpose flour, 1/2c. maseca corn flour, 1/2c. dry polenta, 2T. ground flax seed, 1 1/2t. baking powder, 1 1/2t. dark brown sugar, and 1t. salt. in a measuring cup, beat two eggs with 2T. canola oil, and 1.5c. whole milk. folded the liquid into the dry, whisked for a minute, then let sit for 15-minutes or so. finely diced a small macoun apple (parker farms) and simmered in 1T. unsalted butter with a single sliced dry puya pepper (from christina's spices), and 1T. of dark brown sugar. added a pinch of salt, and then transferred the diced chunks and liquid to a mortar and pestle and lightly brutalized the softened mixture until at the desired consistency. melted a little butter in a hot skillet, poured the right amount of pancake batter in, shook until the right thickness, flipped. that's a pancake. served on some warmed plates with a little of the apple-puya mixture.